We have become so used to the strong upmoves in the last 3 months that downmoves of 2-5% on the index suddenly look like big crashes. But thats part of a trending move. Only on breakdown of certain levels and parameters confirms a trend change. Such a scenario is still not clear so one needs to now just wait and watch with positions made on lower levels and keep a trailing stoploss. -- > In the last few corrections or dips index has not dipped more then 61% of the last upmove. For the current upmove from 16600 to 17790 that level roughly comes to around 17000 odd. -- > The momentum trendline has been again broken at 17400. But the downmoves after that have not been able to penetrate the recent lows. For now the recent low is 16600. -- > The strong trending trendline shown in read colour is around 16900 for the next 1-2 weeks. -- > The trend continues to remain strong till 16900 is not broken for 2-3 days. -- > Only a closing level below 16600 should be taken as a signal to exit short term positions. 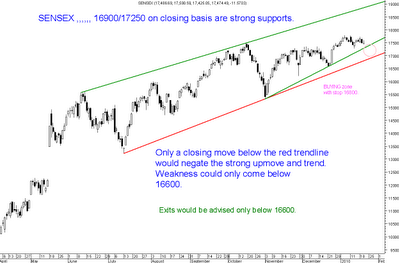 A breakdown below 16600 would make the markets into a sideways consolidation. BottomLine: Let the markets give confirmatory moves by breaking strong levels before deciding the next strategy. 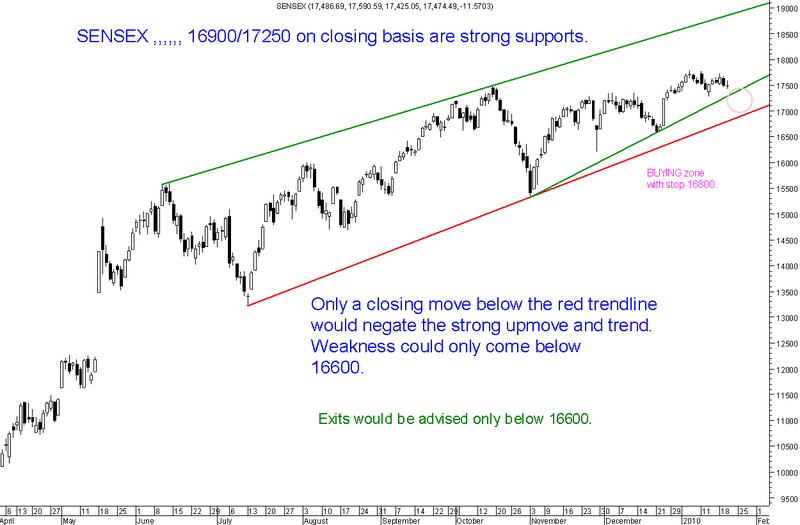 As of now fresh buying on index ( Nifty ) can be done around 16900-17200 with a stop of 16600/16800.